WCC memorial station WA1WCC commemorates the legacy of Chatham Radio / WCC, the renowned RCA coastal station at the Chatham Marconi Maritime Center in Chatham, Massachusetts. At its peak, WCC was the largest U.S. coastal station in the marine service, operating on all the marine bands from low frequency through 22 MHz. WA1WCC can be heard during special events, housed in the building where WCC operators worked ships at sea for most of the twentieth century. In his quest to establish commercial wireless service across the world’s oceans, Marconi demonstrated the possibilities early in the 20th century, finally succeeding in 1908 with stations in Canada and Ireland. In 1912, his American company embarked on a new program, constructing a great high-power station in New Jersey to serve industrial Great Britain, and another in California to serve the Far East. In 1913, plans for a smaller Massachusetts station were announced, to supplement the Atlantic route with service to continental Europe. The Massachusetts station would consist of transmitting facilities in Marion and receiving facilities in Chatham, to be paired with similar installations in Norway. A number of brick structures were erected to house the station and operating personnel. Six towers approximately 350’ tall stretching about one mile were built for the antenna and dominated the skyline for miles around. Construction began in the spring of 1914. Within months, World War I began in Europe. The war would prove to have crippling consequences for Marconi’s ambitions in America. The Massachusetts station was left incomplete. The buildings and structures were in place, but the wireless equipment being manufactured by the parent company in England was not forthcoming, leaving the Massachusetts sites idle. By the time WW I ended, the spark technology pioneered by Marconi had become obsolete. In an orchestrated takeover, his American holdings were assumed by the Radio Corporation of America (RCA) in 1919. The Marconi Wireless Telegraph Company of America was subsequently dissolved. RCA installed CW equipment and for a while operated circuits to Norway and Germany, activating the transatlantic service that that Marconi had only envisioned. At the same time, however, change was underway within RCA. The company was consolidating its intercontinental operations at Radio Central, a huge new station on Long Island, controlled centrally from offices right in the heart of New York. In 1921, in a landmark reorganization, RCA re-dedicated the Chatham station to marine service, improving and adapting the existing long-distance facilities to the business of communicating with ships on the high seas. Call letters WCC, once used by the defunct South Wellfleet station, were again heard by mariners plying the waters of the Atlantic. 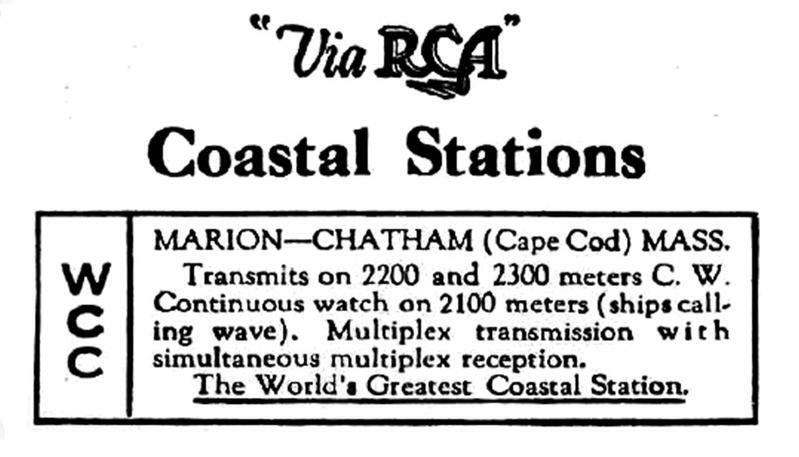 RCA advertising of the ‘20s boasted that WCC was “The World’s Greatest Coastal Station”. 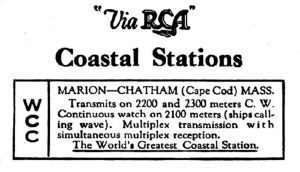 WCC went on to grow and serve global marine interests throughout the balance of the 20th century, Known as Marion Radio pre-war, it became Chatham Radio when the transmitters were moved to South Chatham in 1948. At its peak, Chatham Radio / WCC was the largest U.S. coastal station, serving seafarers around the world until 1997, when traditional marine communication methods gave way to the march of technology. The Marconi presence here in Chatham was brief and unfulfilled, and as a result, this site bears the distinction of being the last in a series of high-power projects begun by the American company before its demise. Today, the buildings remain intact and they appear much as they did when they were first built by Marconi in 1914. WA1WCC operates from the original operating building, which now houses the Marconi/RCA Wireless Museum, a Cape Cod attraction operated by the Chatham Marconi Maritime Center, http://www.chathammarconi.org. WCC ARA members will conduct a special event operation to commemorate the 70th anniversary of the Chatham Radio / WCC South Chatham transmitting station from February 16 at 1200 UTC until February 18 at 2100 UTC. On February 16, 1948, transmitters in the newly-constructed South Chatham transmitting station were put into service, replacing the station in Marion, some 40 miles distant. Marion had been home to the WCC transmitters since 1921. By end-of-day, Marion was completely shut down and WCC was 100% Chatham Radio. From that day forward, Chatham Radio operated continuously 24 hours a day, 7 days per week for five decades serving mariners around the world. All are welcome to contact Chatham Radio and share in the celebration. WA1WCC will operate for Maritime Radio Day, staffed by former WCC and Coast Guard operators working from the Chatham Radio / WCC Operating Building. The following week, WCC ARA members using WA1WCC will activate the 1914 site during International Marconi Day in honor of the famous radio pioneer who left his mark in Chatham.